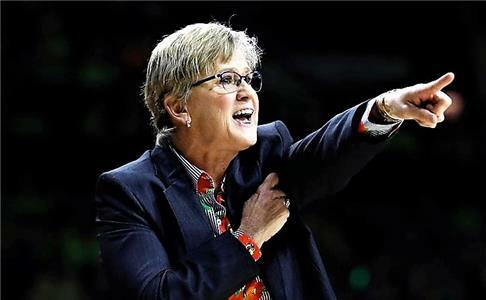 Warkick (On Minimizing Turnovers): "We Need Base Hits, Not Homeruns"
Lady Vols head coach Holly Warlick shouts instructions to her team during Tennessee's 84-70 loss to Notre Dame. With No. 3 ranked and undefeated Mississippi State (19-0, 5-0) gliding into Knoxville on the heels of a crushing 23 point comeback 84-70 loss to No. 5/5 Notre Dame at South Bend, head coach Holly Warlick and the No. 6/7 Lady Vols (16-2, 4-1) are looking for some answers – fast. The game will be broadcast on ESPN2 with a 3 p.m. tip-off from Thompson-Boling Arena in Knoxville. At a press conference prior to practice on Saturday, Warlick discussed the depth of Bulldogs and how she feels senior Mercedes Russell will match up against their senior Teaira McCowan. According to Warlick, “We watched a lot of tape (of the Notre Dame game). Following the game, Warlick was asked if she thought her team had panicked. Her reply was they didn’t get very smart.” One question that remains unanswered, and was asked by all three ESPN commentators during the game, was why did Warlick not call a timeout to try and quell the Irish uprising? Perhaps the coach didn’t get smarter herself. With 28 turnovers committed against the Bulldogs, Warlick talked about the need to minimize those. “We are trying to hit a homerun when we just need a base hit. Make the easy pass. Now, we are playing against better athletes and better defenders. We are seeing a gap, and we are trying to thread a needle, and we don’t need that. If there is not an assurance of what we can do, just pull it back out. We have a hard time pulling the ball back out, I don’t know why we think that is bad. We talked a lot about that today. If you see it, throw it. If not, pull it back out. We don’t need a home run, we need a base hit. "We have to understand. We have to go with what got us here. To use Notre Dame as an example, it was our defensive pressure which led us to easy baskets, which let us get out to a great start. Then we got comfortable, and we didn't want to defend. We can't do that. The score is not indicative of the game. People are going to make runs. We have to stay down and do what got us there. That's being solid on the defensive end and make sure we secure the boards." "Right now, I think it would be man, but I think that depends on who we are playing and what group is in. I would go with our man first, but for me it depends on the situation and who is hot and who is not." "Honestly, maybe a lack of focus. Maybe a concern that the last play we had is affecting our next play. We have been really good at refocusing on the next play. I saw us getting affected by what just happened (at Notre Dame). We really have to get back where we understand that this happened, but now I have to get back and do what I have to do to get a stop." "I think teams adjust to it. They are going to make us beat them by not going to Mercedes, as I would. They are more physical on her. She has to move around. They are doubling her; they are putting three people down, but we have to find better ways to give her the opportunity to score. She has to continue to work hard. She has done a great job, but Notre Dame had a great adjustment. We started not hitting from the outside, so they just kept packing it in on Mercedes. Until you make an outside shot, that's what teams are going to do." "Yes, that is an option. She is very consistent at the elbow jumper and moving around. She is an excellent ball handler for her size. So yes, we can move her around a lot." "Yes, I think they are more efficient. I think each kid on their team is playing her role, and they are doing it really well. I think what has helped is moving Vivian to the four. That allows (Vic Schaefer) to put another quicker guard out and another shooter. They are solid in every position. They are great defenders, and they are smart on the offensive end. They have three-point shooters, penetrators and just an anchor inside. I think it’s his best team he has had at Mississippi State." "I think it is great timing for us. Coming off the loss we understand that we need to be more focused. We have to tune in. We have to stick to our game plan. I'm okay with the game being now. We understand. We have seen them, and we have watched them. Our kids have watched Mississippi State. We have a tremendous amount of respect for them. I know it's a challenge, but I can't think of a better time to play them than after a bad loss for us." "It does help. We were in three tough environments, and I thought Notre Dame got to us. I think (the team is) happy to be home. It's a learning process for these freshmen. Now we're going against better athletes, people that know what they do. It's no longer that Rennia Davis, or any of those kids, is a secret. We have to really be on point, focus in and be a part of this team. But it's going to do nothing but help these freshmen. That environment, who we're playing, what they need to do - they've had to grow up really quickly this year." "We've been a really good team of answering people's runs. We didn't at Notre Dame. But win or lose, now we have to focus in on (Mississippi State), and that's what I think has made this team really special. They haven't really zoomed in on what happened as far as having a great win and then having to refocus, or having a bad loss and then having to refocus. They've really dialed in, and that's why I think this team has been a special team for us." "She's fine. Her pride got hurt a little bit probably, but she's good. And that was a legal screen. I thought Meme hung tough. I thought she had a tough game, and she got back up. I wanted her to get back up a bit quicker, but I didn't run into that screen." "After we watched film... I think a lot of them kind of wore their feelings on their sleeve (after the loss at Notre Dame), and I don't think they realized exactly how we got to the point we did. Once we saw it, they're like 'Oh, wow.' And I actually let them sulk for the day. We had a pretty hard practice yesterday, and some of them struggled a little bit, but today they bounced back. We had a great prep, and that's what it's all about. And they have been good at moving on. That one stung. I get it, it stung with me too. I told the group, 'We're going to talk about Notre Dame today. We're going to fix it, and then tomorrow we're not going to bring it back up.' And that's what we've done." "I think number one, she's in better shape. Number two, they're looking for her more. Number three, she's really, really physical. She's a tough kid to guard, and she keeps the ball up, and she's 6'7", so it's a difficult guard. Mercedes is going to have to do her job and keep her off the boards. She's become a really good offensive rebounder. I think she's an anchor for that group. She allows the guards on the outside to play freely and penetrate and shoot because they know that they have somebody to clean them up inside." "I think she plays better when she matches up with people her height, because when they're smaller, they kind of get up under her and crowd her. If you're a post player and somebody smaller gets under you, you're a little hesitant to jump and move. I think Mercedes has had some of her best games when she has gone against someone her size." "That's frightening for us. They get after you. You better protect the ball. They have great on-ball pressure, great denial. So we really have to be sharp and see the whole court and not be predetermined. A lot times our turnovers are predetermined. People scout us and know what we want to do. That's why you have to play the game, get in your concepts and make your plays. You have to make your plays but also take what they give you." "In my eyes, they're not freshmen anymore. They are playing a lot of minutes because we need them to play minutes. That's how we got these kids. We didn't promise them they were going to start, but (we said), 'You're going to play a lot because we don't have a lot of guards.' And if you look across the country, some of the freshmen that are sitting have great players playing in front of them. Take Texas. They have two kids that were No. 2 and No.3 in the country in recruiting, but also playing behind Ariel Atkins, who is unbelievable. And then also Brooke McCarty, who's unbelievable. Those kids who I'm using as an example, they're playing behind pro players. WNBA, pro players. They get to learn from them, and that's what's great. They can really focus in on sitting and learning. It's like Kasi (Kasiyahna Kushkituah). She's sitting and learning behind Mercedes. Because when Mercedes leaves, Kasi's minutes are going to jump sky high, so she needs to absorb everything she can from Mercedes Russell, as should all of those kids. And it's not a guarantee. You have to prove yourself, and if you're ranked high and don't get it done, you're not going to play." With so many questions, the one that really remains to be answered is whether or not this young Tennessee team can bounce back like they did following their overtime loss to Texas A&M with a win against defending national Champions South Carolina. Can they dig deep enough to pull off a win against a highly touted Mississippi State?